There are a few things that I've tried several different recipes for over the course of this year in the hope of finding the perfect recipe. I've found my favoured recipes for naan bread, vanilla cupcakes, lemon cake and meatballs (this is a cheat because we settled on Waitrose ones). Poor lighting - taken at 4.57am! But good chocolate cake has eluded me. Pre-blog, I had made Angela Nielsen's Ultimate Chocolate Cake and after a disaster with a vanilla cake, it gave me a back up base cake for this challenge. 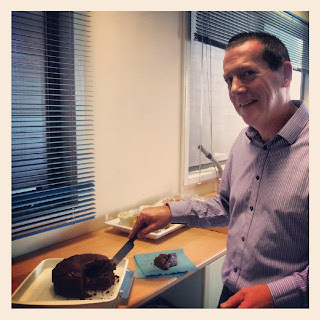 I then tried Nigella's chocolate cake which I really wasn't a fan of. 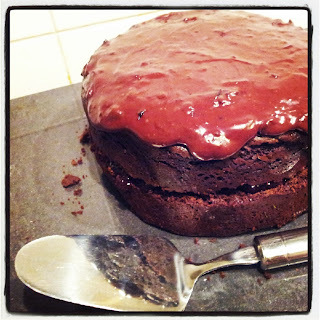 I had a disaster with Dan Lepard's Brown Sugar Chocolate Cake and a similar crisis with a chocolate and clementine loaf cake that Miss A and I tried to make the other day that I was too embarrassed to blog about. So today, having made a bargain with Miss A that if she'd make a lemon cake for my Grandad's birthday on Saturday (he hates chocolate cake, she believes that all birthday cakes should be chocolate), we set about trying Dan Lepard's Dark Chocolate Berry Cake for me to take in to work tomorrow for my lovely colleagues on my Business Process Excellence course. Having made a deal with the trainer that if we finished by 4pm today, I'd bring in cake tomorrow, I was a little nervous that I'd have a further disaster (I'm touching my laminate floor in the hope I don't now jinx myself and drop the darn thing on the way into work in the morning!). But so far, so good. I nearly forgot the butter - which is the very first ingredient - but managed to redeem myself at the last minute. Then I didn't realise that if you start the timer on my mobile phone and then plug it in to charge, it stops the timer. Thankfully I'd double checked the time on the cooker clock when I put the cake in so I was able to work out how much longer it needed and now it's nicely risen and cooling in the tin. Of course, by the time it's completely cooled I will have to be in bed, meaning that I need to ice it first thing in the morning. My only comment (so far) is that the instructions are a little scant for the novice. For example, with the icing, it doesn't tell you to melt the chocolate in a bain marie. I'm partly tempted to do it straight in the pan but I could do without a burnt chocolate crisis at 5am. Nor does it tell you how to cool the cake - in the tin or on a rack? I'm going for the in the tin method. Keep your fingers x'd for me and I'll update the post tomorrow with a picture of the finished article and some feedback. Having gotten up at 4.30am to ice the cake this morning, I'm afraid it's not particularly photogenic and the picture is poorly lit. However, I'm loving the chocolate icing with the subtle hint of berry coming through from the jam. I used cherry jam with mine and I absolutely recommend buying the Mirabel jam that you can get in Lidl which I used for my cherry Viennese whirls. It has a really strong, sharp cherry flavour and cuts well through the chocolate. I find English cherry jams far to sweet and I think they'd be lost in the richness of the frosting. One miniscule criticism is again surrounding the food photography. This time, it's the Guardian's website. The stylist seems to have used a buttercream type frosting rather than the chocolate/jam/icing sugar version that Lepard suggests. The icing in the official picture is very smooth and thick, showing no hint of cherries lurking in it - which is a shame. Or maybe they just used a sieved cherry jam? Nobody's ever going to taste that picture so they probably only cared that it looks aesthetically pleasing. And in this instance, there's no picture in Short and Sweet to compare it to as the recipe isn't in the book. Anyway on to the reviews. My chief cake tester is on his holidays at the moment. The second in command (on the cake testing front) gave it the seal of approval, as did the rest of the course delegates and the assorted managers who came to review our final presentations. In fact, I've now been invited to attend twenty training sessions taking place between now and Christmas by one manager who was told that I always take cake when I got to a training session. He'll be lucky! My personal opinion from the tiny sliver I had was that it was a good, flavoursome, solid cake that would stand up to a wide variety of fillings and could probably slice well into a three layer cake. It was a little drier than I would've liked which is purely my own fault. Partly because of the timer issue (see above) and partly because I was trying to juggle Miss A into bed around the time it was due out of the oven so it got a few minutes more than it should have had. Nevertheless, I will definitely be making this one time and again. Chocolate cake recipe? Sorted. And finally, thanks to Hutch who got press-ganged into having his pic taken for the blog - just to prove I don't eat all the cake myself!